If you’ve lost teeth and have not replaced them with dental implants, or if you have difficulty applying dentures, it can be tempting to try and eat without them. Over time, you might even become good at it. While this approach may seem convenient, eating without teeth or dentures can be dangerous to the mouth and the rest of your body. 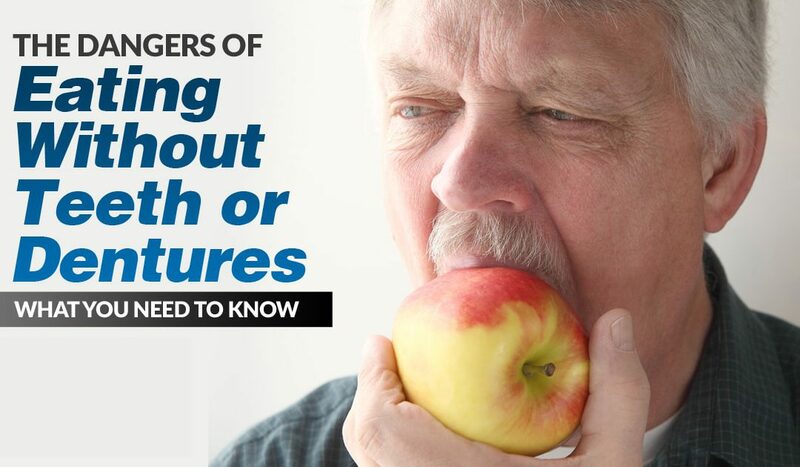 Before you or someone you know has their next meal without teeth, consider these health risks that can occur as a result. When you try to chew without teeth, your gums and jaws have to work even harder to ensure that food is chewed enough to swallow. The bite force of natural teeth is around 200-250 pounds of force, while the force of dentures is about 50 pounds. This means dentures are much less powerful than original teeth, but this is definitely a case where something is better than nothing. Over time, your teeth and gums will become sore and irritated from having to work extra hard to properly process food, even softer foods that do not appear to require a lot of chewing. This can lead to more serious problems like TMJ and infected gums. The jawbone is also in a constant state of flux and changes in response to pressure placed on it from teeth or dentures. Without this pressure, the bone becomes weakened over time and is more prone to fractures. Sure, there are a lot of recipes out there for smoothies, purees, and other foods that claim to be safe to eat without teeth. This is technically true, but this diet is only intended to be followed for short periods of time such as the period between when natural teeth are extracted and when dentures are ready. Digestion is a complex, multi-organ process where all of the pieces must fall into place for it to work as planned. The entire process begins in the mouth, and throwing a wrench into the system by not properly chewing food can lead to problems later on down the line in the digestive tract. When food is not well chewed and the food fragments are too big to be properly broken down, incomplete digestion occurs. Not only do nutrients not get extracted from the food but undigested food also becomes fodder for bacteria in the colon. This can lead to bacterial growth, flatulence, and other symptoms of indigestion. Eating a diet composed of foods that have already been processed enough to not require chewing is not much better as your body does not have the opportunity to absorb nutrients through the chewing process. Chewing is also directly connected with the movement of food through your digestive tract, and, in particular, with the movement of food from your stomach to your small intestine. Saliva from the chewing process help relax the pylorus, a small muscle at the lower end of the stomach, enough to allow food to pass into the small intestine and through your digestive tract. The process of chewing also signals the rest of the gastrointestinal system that the digestive process can begin. It stimulates the taste receptors in the mouth, which relay messages to the stomach to start producing acid to aid with digestion once food reaches it. It also signals the pancreas to begin producing enzymes that are passed into the small intestine to aid with digestion there. Eating without teeth or dentures can cause serious short and long term problems. Teeth play an important role in your body and trying to live without them is not a great long term plan. There are many reasons why you or someone in your life may be trying to get by eating without teeth or dentures. Whether it’s due to finances, embarrassment and shame, or something else, whatever the reason, 1st Family Dental can help come up with a plan that fits your situation to help you get back on track. We’ve treated thousands of patients and have seen it all so don’t let fear hold you back. Our caring and compassionate staff will work with you to get you chewing properly again and enjoying all your favorite foods.